The Center for Nonprofit and NGO Studies is proud sponsor of the Chicago Volunteer Expo! Held at the Peggy Notebart Nature Museum, the Expo highlights the work and volunteer options for over 85 Chicago area nonprofit organizations. Nonprofit and NGO student Ambassadors and Outreach Coordinator staff the day-long Expo, sharing our excitement and building relationships with volunteers and nonprofits. We're excited to share the 2017-2018 DeKalb County Nonprofit Study. Produced in collaboration with the DeKalb County Nonprofit Partnership, and funded by the Douglas C. and Lynn M. Roberts Family Foundation, the study's results offer useful insight about the nonprofit sector in our county. Nonprofit and NGO major Emma Villella was chosen as NIU’s nominee for the Newman Civic Fellowship, a program of Campus Compact. NIU Today article, NIU students making a difference across DeKalb County, tells of the DCNP/NNGO Internship program. This paid internship has placed over 120 interns at 40+ nonprofit organizations in DeKalb County. Professor Anne Hanley, former interim director of Nonprofit and NGO Studies, was awarded a Fulbright Fellowship for the first half of 2019! She will be in residence in the Economics Department of the Universidade de São Paulo, Ribeirão Preto campus, teaching a graduate reading seminar on the economic history of Brazil and conducting research on banking and credit in Brazil in the early 20th century. 16 students were placed in paid internships at nonprofit organizations within DeKalb County as part of the DeKalb County Nonprofit Partnership/Center for Nonprofit and NGO Studies (DCNP/NNGO) Internship Programs. 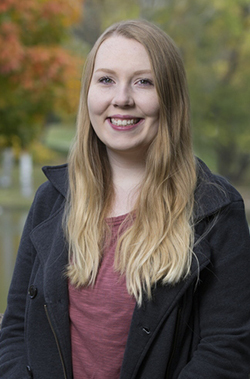 Nonprofit and NGO student student Paulina Snopek was chosen as the Student Marshal for the College of Liberal Arts and Sciences for December graduation ceremonies. Paulina was chosen for this honor from a group of graduating seniors noted for exceptional academic achievement and outreach to the campus and community. Students in Professor Schatteman's PSPA 301: Philanthropy and Fundraising class made awesome videos to use as friend- and fundraisers for their nonprofit partners. Check out these these fun and informational pieces on DeKalb County Youth Service Bureau, Kishwaukee Special Recreation Association, Tanzania Development Support, Dekalb Area Agricultural Heritage Association (DAAHA), We Care Pregnancy Clinic, Neighbors' House, Girls on the Run NW Illinois, Midwest Museum of Natural History, Sycamore Education Foundation, The Gracie Center, and Egyptian Theatre. Professor Alicia Schatteman shared her expertise in collaboration with the DeKalb County Nonprofit Partnership, where she led local nonprofit executives on a timely training titled Evaluating the Nonprofit Director. Nonprofit and NGO Studies hosted a reception in celebration of the placement of over 100 interns as part of the DCNP/NNGO Internship program – an amazing milestone! Program partners, the program funder, local nonprofit hosts, and students themselves attended the celebration. Thanks to Ben Bingle at the DeKalb County Nonprofit Partnership, Cathy Doederlein at Northern Illinois University Career Services, and to the Doug and Lynn Roberts Family Foundation for partnering with NNGO on this unique program. Professor Alicia Schatteman and Professor Ben Bingle shared their expertise at the ARNOVA annual conference in Grand Rapids, Michigan. They spoke on a panel about building strong practitioner and academic relationships. ARNOVA is the Association for Research on Nonprofit Organizations and Voluntary Action. Nonprofit and NGO Studies was well represented at the ARNOVA (Association for Research on Nonprofit Organizations and Voluntary Action) annual conference in Grand Rapids, Michigan. Drs Bingle, Einolf, and Schatteman were in attendance. NNGO students Candy Melara and Maalik Phipps also attended, having earned full Undergraduate Diversity Scholarships to the conference. Kudos to Professor Einolf! Two of his papers, "The Link Between Religion and Helping Others: The Role of Values, Ideas, and Language" and "Gender Differences in the Correlates of Volunteering and Charitable Giving" were ranked 99th (out of 24,440 articles) and 44th (out of 7,834 articles) respectively by Web of Science in the categories "Sociology" and "Social Issues." WoS is an online subscription-based scientific citation indexing service which gives access to multiple databases that reference cross-disciplinary research. Professor Einolf of Nonprofit and NGO Studies, as part of NIU’s School of Public and Global Affairs, presented at “Globalization: Immigration and Free Trade”, an event for regional AP Government and Economics high school students. Nonprofit and NGO instructor Rodrigo Dominguez-Martinez presented at the 2017 Latinx Educational Excellence in the Midwest conference at University of Iowa last weekend. He and co-presenter, Matthew Simpson (NIU MPA '14), presented on community-based research, engagement, and intervention of communities of color using a critical race lens. The presentation was based on the nonprofit My Brother's Keeper, which focuses on the persistent inequalities facing boys and men of color. NNGO faculty member Professor Laura Heideman presented a Brown Bag Research Talk. Her topic, 'Humanitarian Contradictions: The Formation and Demise of the Humanitarian Corridor in Croatia", was an up-close look at the recent refugee migration out of the Middle East through Europe. Candy Melara, a Senior Nonprofit and NGO Studies major, was named an NIU Honors Program Fellow. Melara is also pursuing her minor in Public Administration and certificate in Social Enterprise. Candy is involved with the Huskie Food Pantry (Operations & Volunteer Coordinator Intern), Mortar Board Senior Honor Society, Leadership Academy, Jobs PLUS, Latina Assistance Program, Archery Club, Tau Sigma National Transfer Honor Society, and Communiversity Gardens. Things were poppin' during our 'Pop By and Say Hi' event! Students stopped by for popcorn and pop, and a chance to meet our new Director, Professor Chris Einolf! We had a great time with nonprofit executives at our Meet-n-Mingle event. The breakfast was an opportunity for Professor Chris Einolf, the new Director of The Center for Nonprofit and NGO Studies at NIU, to meet members of the local nonprofit community. We're fortunate to be able to partner with such outstanding organizations! Special thanks to Brian Reis and the Board of the Ellwood House Museum for allowing us to meet in your gorgeous space. 17 interns and nonprofit host sites were matched for the Fall 2017 DCNP/NNGO Internship program, a paid internship program presented in collaboration with the DeKalb County Nonprofit Partnership (DCNP), NIU’s Center for Nonprofit and NGO Studies (NNGO), and NIU’s Career Services. Dr. Chris Einolf and Julie Ann O’Connell attended the Nonprofit Academic Centers Council (NACC) Biennial Conference in Indianapolis. Nonprofit and NGO Studies welcomed a new Center Director, Dr. Christopher Einolf. Dr. Einolf is tenured in Sociology, and comes to NIU from DePaul University. The Center for Nonprofit and NGO Studies became the new name for the former Center for NGO Leadership and Development. The major, minor, and certificate are now in Nonprofit and NGO Studies (replacing Community Leadership and Civic Engagement). Dr. Alicia Schatteman presented at the Campus Compact teaching and learning conference at Loyola University (Chicago) about using a social justice lens to teach philanthropy and fundraising. Dr. Anne Hanley was awarded a National Endowment for the Humanities Summer Stipend Award to continue her research on how the first census and adoption of the metric system affected Brazil’s economy. NGOLD participated in the Chicago Volunteer Expo, where over 100 nonprofits were looking for volunteers and a record-shattering 3500+ people were looking to find their perfect nonprofit match. The CLCE Ambassadors helped staff NGOLD’s welcome table and sponsored luncheon. Dr. Alicia Schatteman was named a Service Learning Faculty Fellow by the Office of the Provost and the Office of Student Engagement and Experiential Learning (OSEEL). Dr. Schatteman is a member of the first cohort of fellows in this new program that promotes the integration of academic service learning into NIU curricula. Fellows will work to promote service learning through leadership and guidance. Dr. Mark Schuller, joint faculty member, on recently received the 2016 Anthropology in Media award.